Caltha is a sort of perennial grassy plants belonging to the family of Ranunculaceae and numbering about 40 types. In the wild nature these plants live in damp districts, near various reservoirs, and also directly in the water. Caltha can be met in all countries with a temperate climate. The Latin name of a plant resembles from the word "kalazos" which is translated with Greek as "bowl". In a form the blossomed Caltha's flowers really remind a certain vessel. Possibly, the origin of such names of plants as a calla and a calendula gives in to the same explanation. 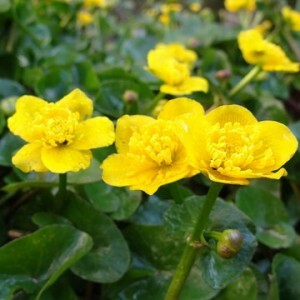 In various dialects there are also other names of Caltha, for example: night blindness, splash pool, shaft, water snake, yellow St. John's Wort, carrion crows eyes, cow/oil/grease color. Marsh marigold variety. Marsh marigold cultivation.